Taste Radol’ca 2017 is Go! It was a rather blustery, but nonetheless tasty, start to this year’s Taste Radol’ca last Friday. 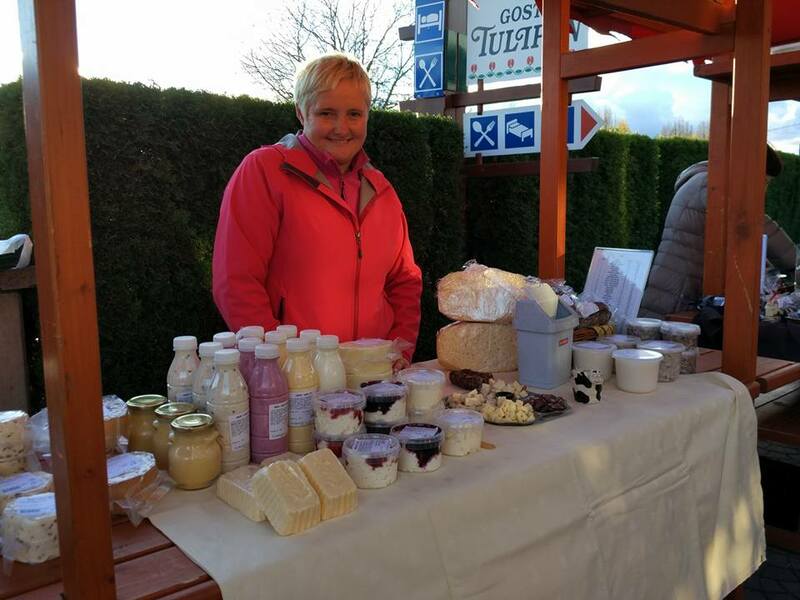 The opening event, a market where local suppliers were offering their products to try and buy, was followed by the gourmet 5-course opening dinner. 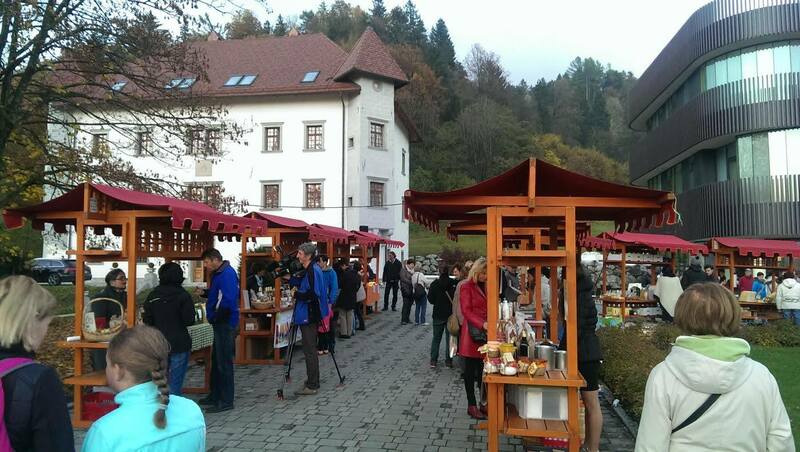 This year the opening dinner was held at Gostišče Tulipan in Lesce. Tickets sold out in record time thus, alas, for the first time since it’s inception I wasn’t present at the opening dinner, however I did pop to the pre-event market to try out some of the finger food! This is now the 5th year of Taste Radol’ca and, as per the previous years, for the whole month of November all the participating restaurants will be offering set menus for a fixed price of 17 euros per person. The ethos of Taste Radol’ca is locally produced products – products direct from local farmers, fruit growers, fish farms, bakers etc., thus with neglible food miles and every food item is traceable – as well as co-operation among restaurateurs = strength in numbers! 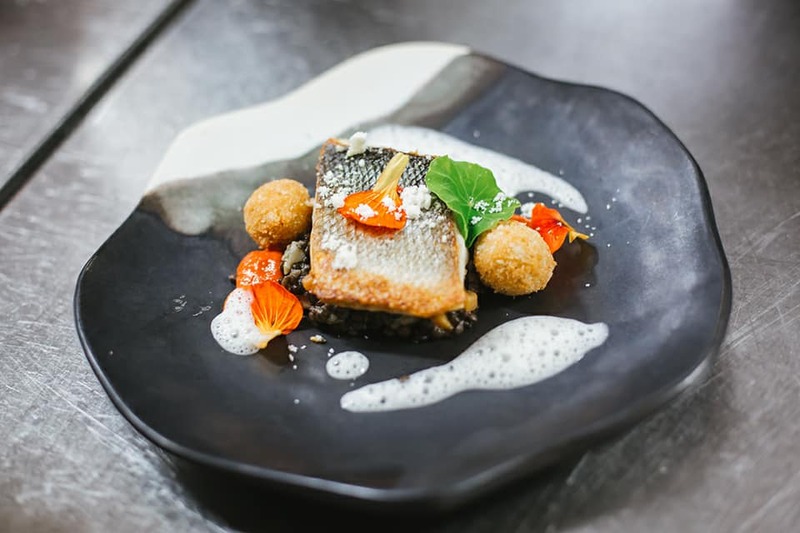 This year there are 9 restaurants participating in Taste Radol’ca: Vila Podvin in Mošnje, Gostilna Avguštin, Gostilna Lectar and Gostilna Kunstelj in Radovljica, Gostišče Tulipan in Lesce, Gostilna Draga and Gostilna Tavčar in Begunje, Joštov Hram in Podnart, and Hotel and Chateau Lambergh in Dvorska vas. Although there are less restaurants taking part this year (there were 13 last year), the focus has shifted somewhat from quantity to quality. 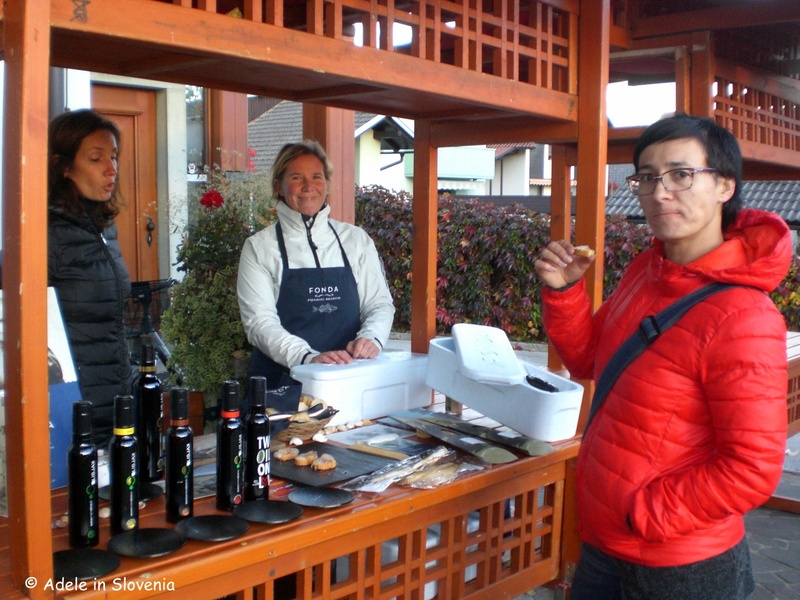 To this end, two of Slovenia’s best-known restaurant critics, Violeta and Uroš Mencinger, were invited to visit (unannounced) and evaluate each restaurant. The aim of this was to ensure that restaurants bearing the Taste Radol’ca name are upholding standards worthy of the name. “It’s not all that simple to eat that much in all twelve restaurants. But it was good and therefore enjoyable! Radol’ca already has the most beautiful square in Slovenia, now it is well on the way to becoming a renowned and desirable culinary destination known for its variety – from top restaurants for the discerning and curious, to local, family, and traditional Slovenian restaurants for those who love eating and lovers of fine food.” said the Mencingers at the end of their evaluation of Taste Radol’ca restaurants. I had a sneak peek of rehearsals for the evening’s sketch performance – proof that Taste Radol’ca’s talents don’t only lie in the kitchen! Throughout the whole month there are also accompanying events taking place, such as free entrance to the Lectar Inn Museum and Workshop. The new Taste Radol’ca brochure is now available, where you can find a brief description of each restaurant and a recipe, as well as details about Taste Radol’ca Tours, which are ideal for you if you are limited on time and/or can’t decide which of the restaurants to choose from. 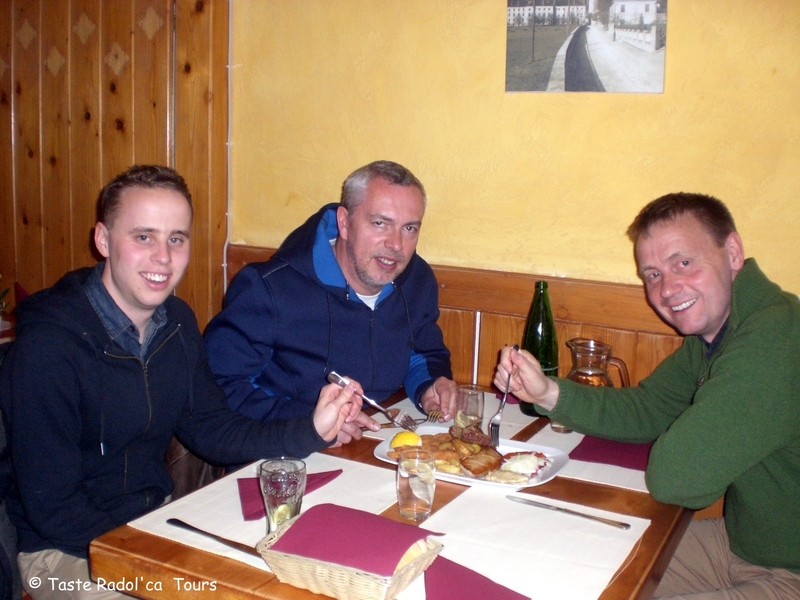 For more information about Taste Radol’ca Tours click the tab at the top of this page. As ever, the hardest part will be deciding which of the delicious-sounding menus to try first, but I’m up for the challenge! 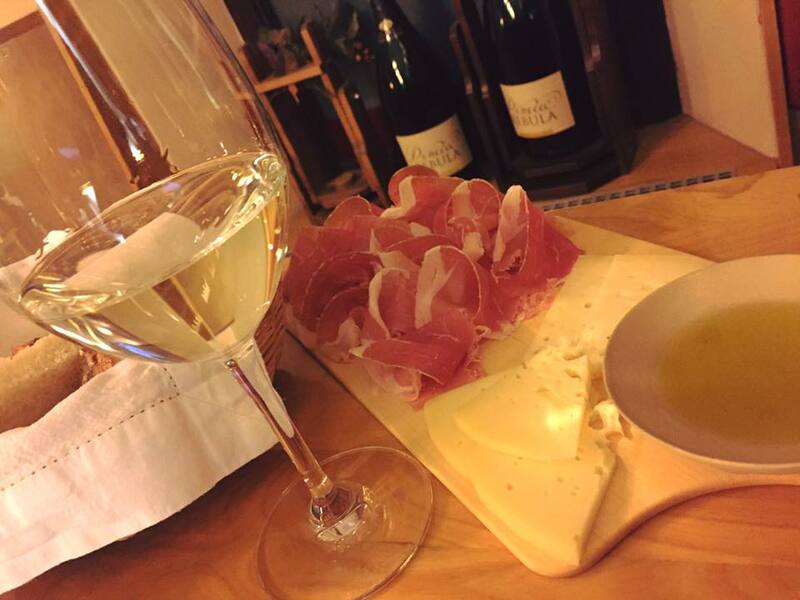 NEW: Come Taste Radol’ca with Me! 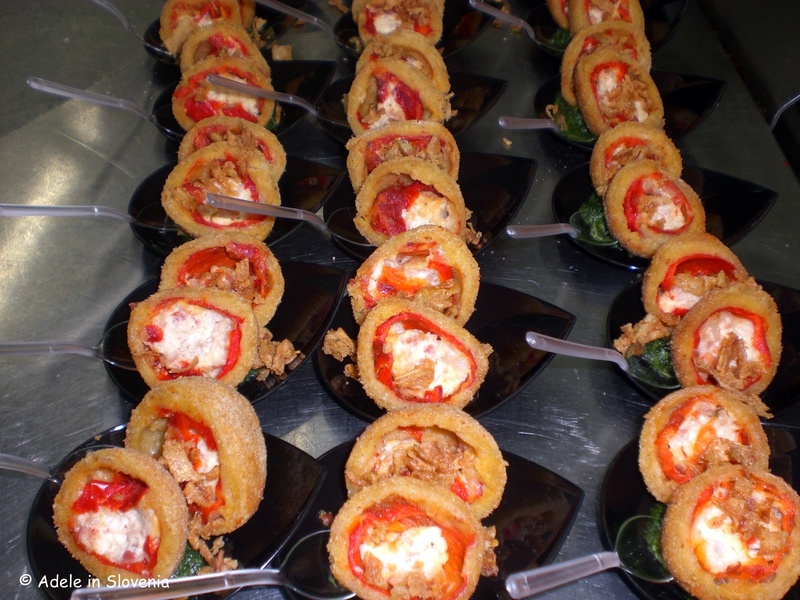 COME ON A TASTE RADOL’CA FOOD TOUR WITH ME! I had been mulling over the idea of offering Taste Radol’ca Food Tours for quite some time, and now, at last, I’ve found the time to bring it to fruition! Until now Taste Radol’ca had largely been concentrated on the main event – the month-long special menus and events in November. 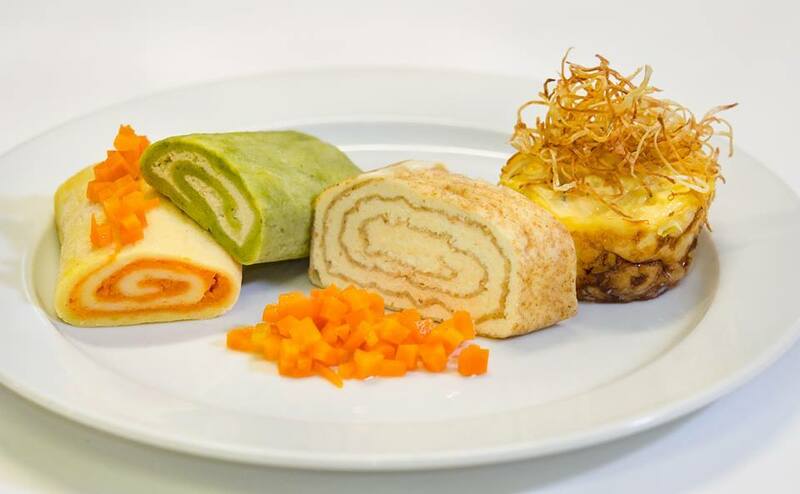 However, since all the restaurants offer special Taste Radol’ca dishes year-round, I figured why not open up the opportunity for visitors to Radovljica to also have the opportunity to Taste Radol’ca year-round. 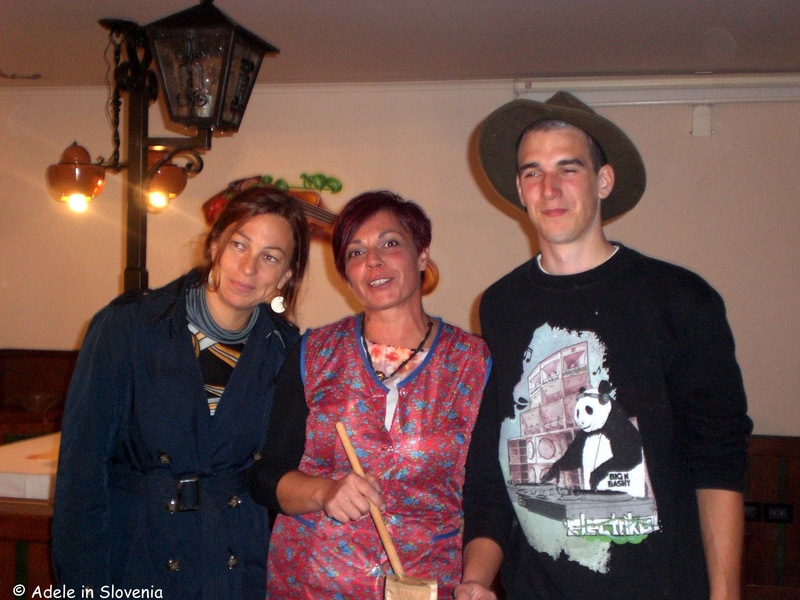 So, I set about arranging a get-together with restaurant owners and acquainting them with my idea, which they were all very enthusiastic about, and getting my head together with Iva from Ljubljananjam, who offers food tours of Ljubljana http://www.ljubljananjam.si/ and, hey presto, Taste Radol’ca Tours is go! You just love eating and drinking! I’ve put together 4 suggested itineraries, which you can see below. However, all tours can also be custom-made according to your wishes. So just get in touch and we’ll take it from there. 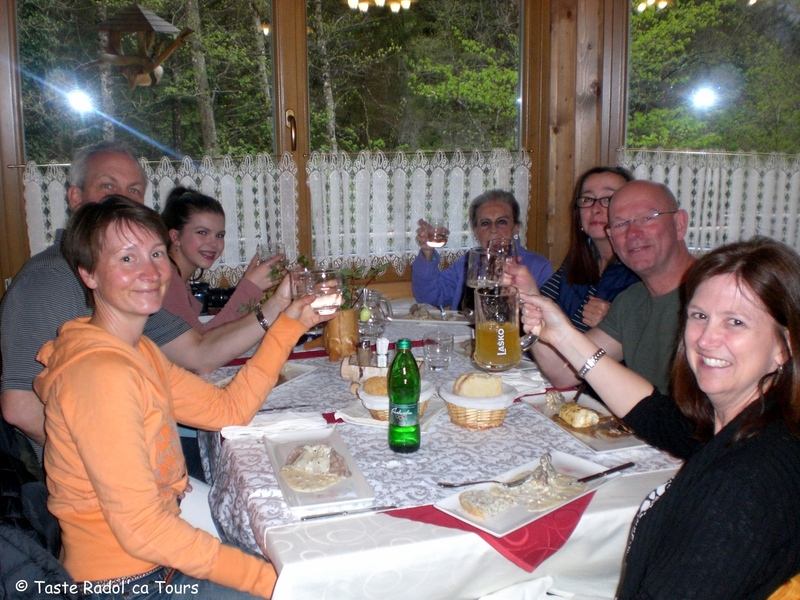 For more information about the tours see the Taste Radol’ca Tours section of this site here https://adeleinslovenia.com/taste-radolca-tours/, where you can also find an enquiry form to complete. So, come and taste the sunny side of the Alps with me and I look forward to meeting some (more) of the readers of my blog and showing you just how beautiful and tasty Radol’ca really is! 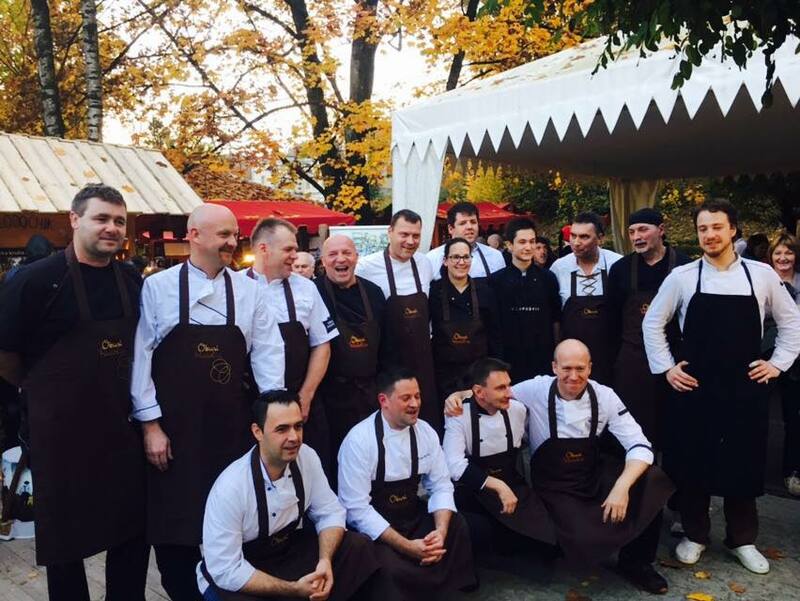 Taste Radol’ca 2016: The Opening – Too Many Cooks DON’T Spoil the Broth! 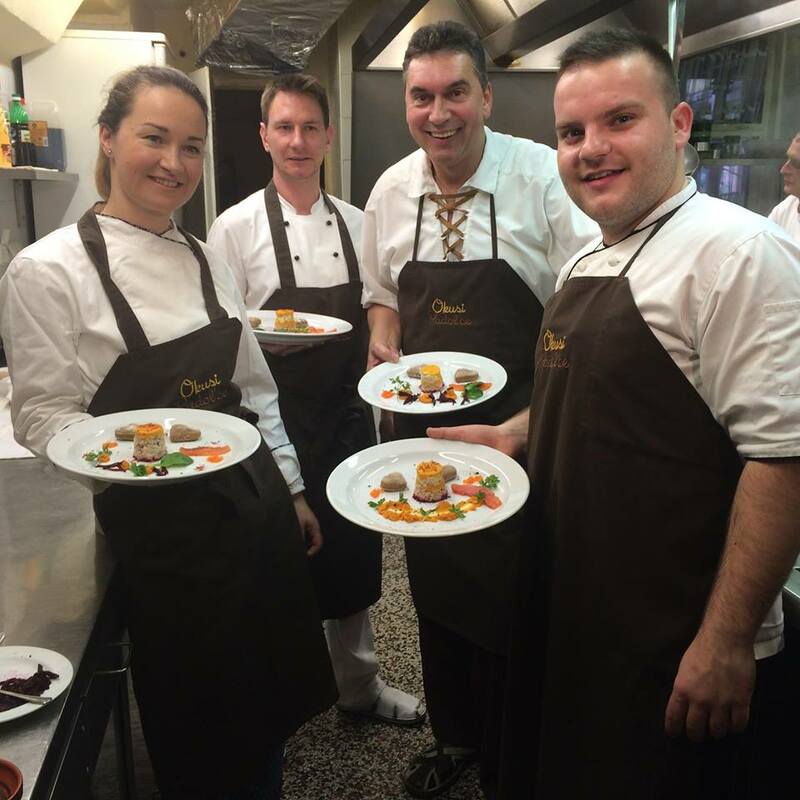 Now in its 4th year, Taste Radol’ca keeps going from strength-to-strength and has really enlivened the month of November – a traditionally quiet month in the hospitality industry – in the restaurants in Radovljica and its surroundings. 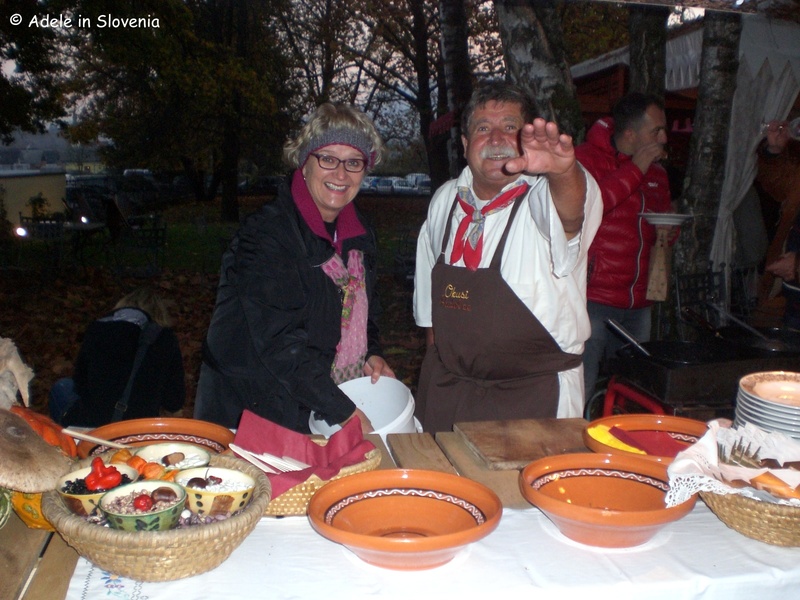 The evening began with a local farmers and craft market, with tastings of food provided by the Globočnik Excursion Farm (Izletniška kmetija Globočnik) and Gostilna Avguštin. 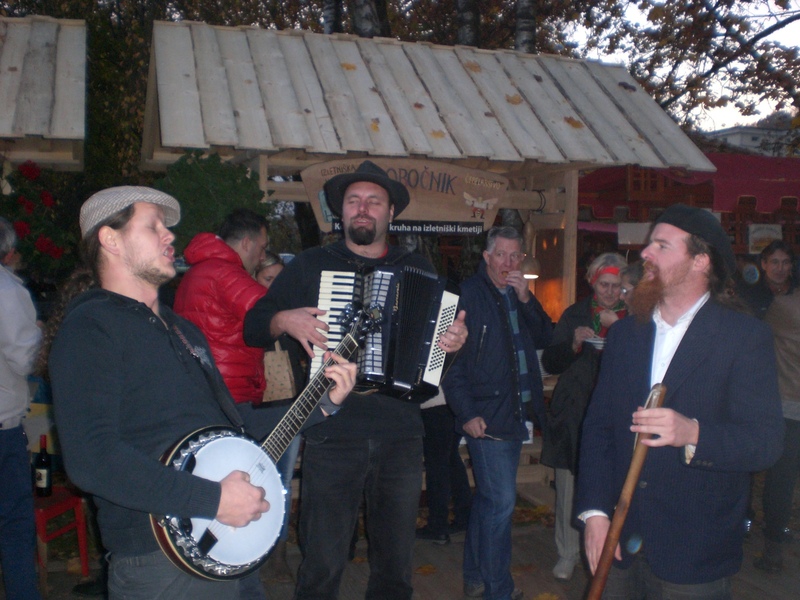 Live music was provided by the band ‘Suho cvetje’, who entertained visitors throughout the evening with their unique style of music. 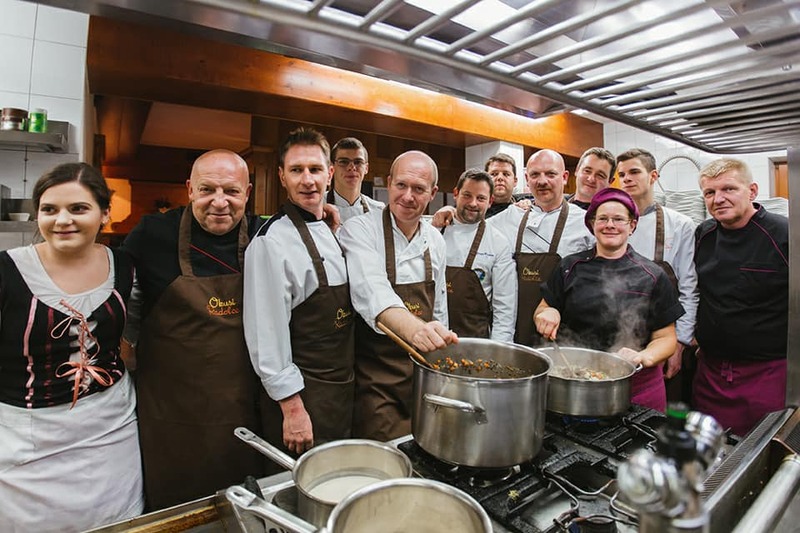 At 7pm we were ushered to our seats in the restaurant for the main event, whereby each dish was concocted and cooked by the Taste Radol’ca chefs, teaming up to create the culinary sensations you can see below. 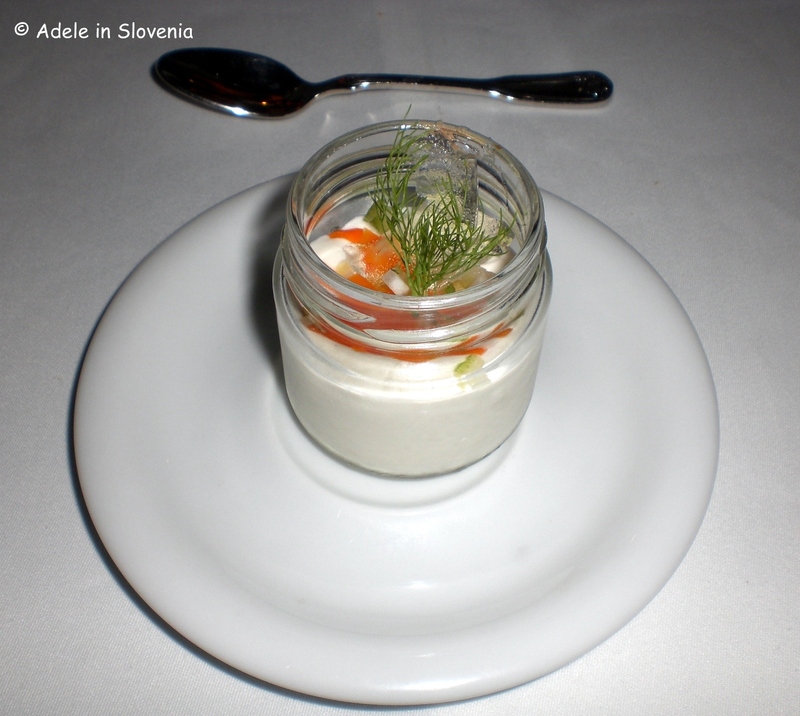 The first course was chilled smoked trout, buckwheat ice-cream served on a blini, and beetroot and horseradish – prepared by Grajska Gostilnica and Tulipan Inn. 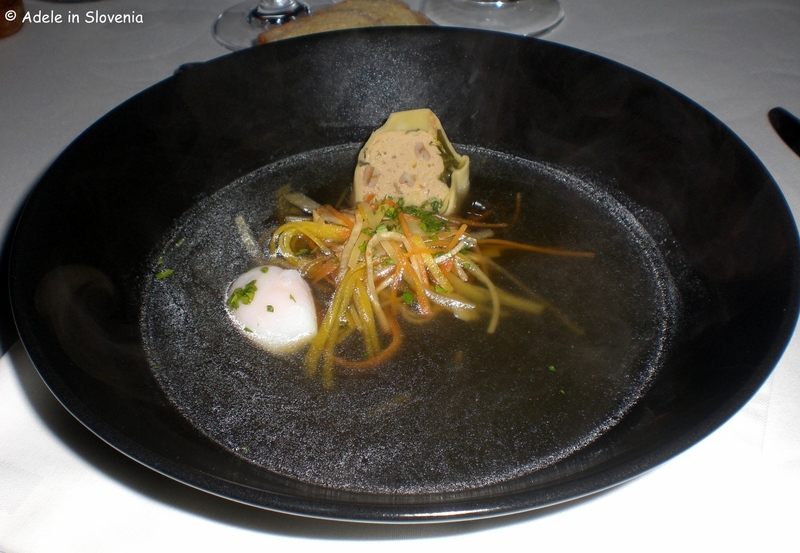 Next came quail soup with a quail’s egg and julienne vegetables, prepared by Draga Inn and the Krek Restaurant. The third course was calves liver with onion, polenta, salad and edible flowers – prepared by Lectar Inn and the Lambergh Restaurant. To cleanse our palates in preparation for the main course we were then served a ‘juniper berry sorbet’, which wasn’t actually a sorbet at all, but a creamy and clever spin on one, courtesy of Kunstelj Inn. Finally, already fairly bursting at the seams, it was time for the main course! 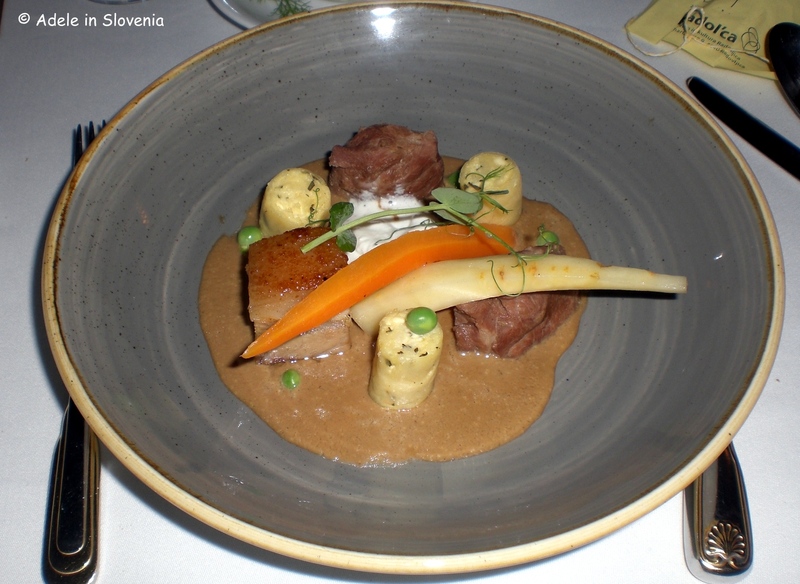 Cheek of pork, tarragon struklji and caramelised vegetables – prepared by Vila Podvin and the Avsenik Pri Jožovcu restaurant. And, the dessert was certainly worth waiting for! A unique and delicious take on a plum strudel with curd cheese, vanilla cream, served with cinnamon ice-cream – prepared by Joštov Hram and Gostilna Tavčar. But that was just the start! Now comes a whole month of eating and trying out the delicious-sounding Taste Radol’ca menus at all 13 restaurants! Well, actually, I think 13 in one month might even be a bit beyond me, but I’ll give it a try, I’m always up for a challenge, especially where food is involved!!! 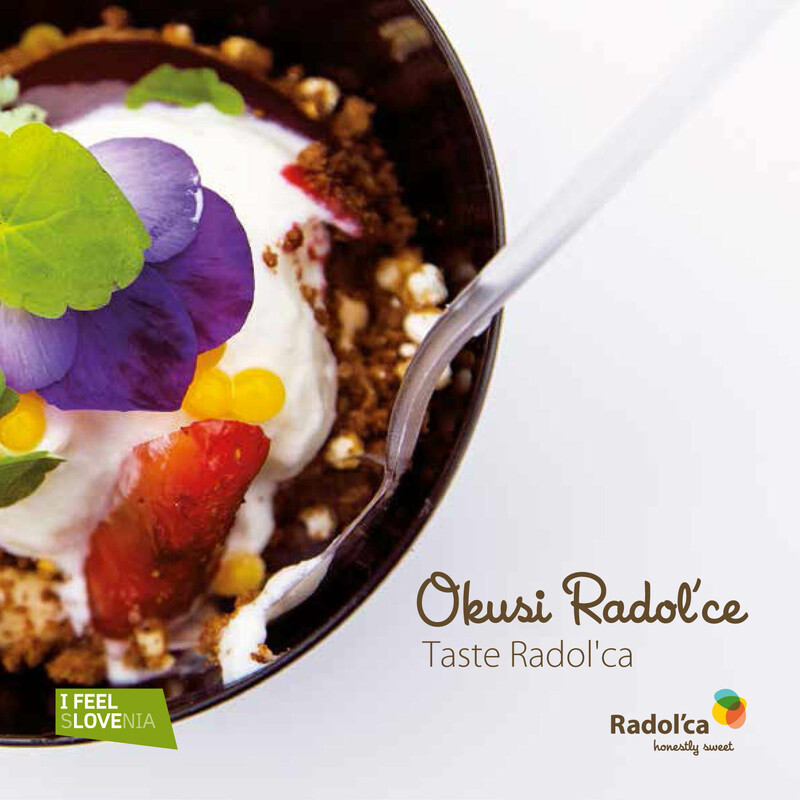 More information about Taste Radol’ca can be found here – http://www.radolca.si/kaj-poceti/dogodki/okusi-radolce-2016/83/2053/ (in Slovene), and here – http://www.radolca.si/en/what-to-do/events-1/taste-radolca-2016/83/394/ (in English). Taste Radol’ca 2015 is GO!!! 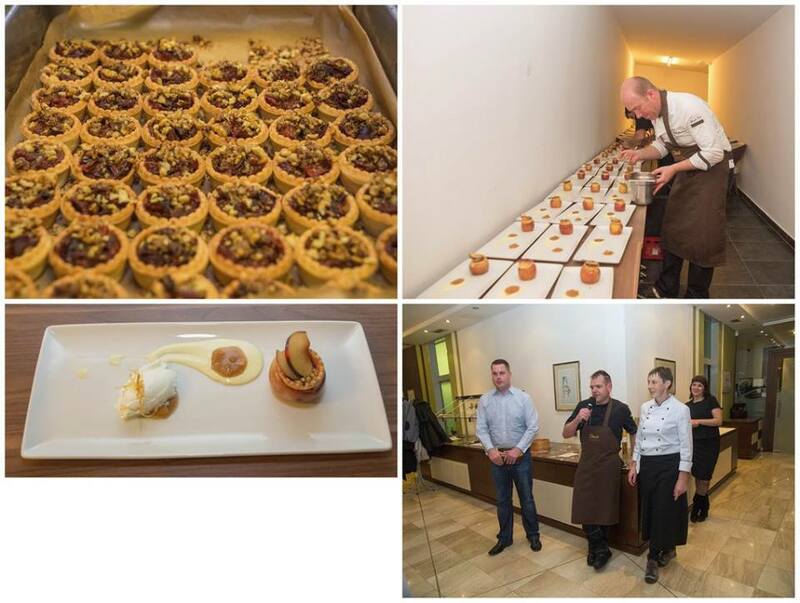 This year’s Taste Radol’ca kicked off with a bang on Friday night with the opening event held at Lambergh Chateau & Hotel in Dvorska vas. The evening started with a market, where local producers and suppliers to the 11 participating restaurants offered their products to taste and buy and the talented Taste Radol’ca chefs rustled up some tasty warming morsels to satisfy the peckish! Entertainment was provided by the popular singer Nuša Derenda, in the lovely setting of the chateau grounds. 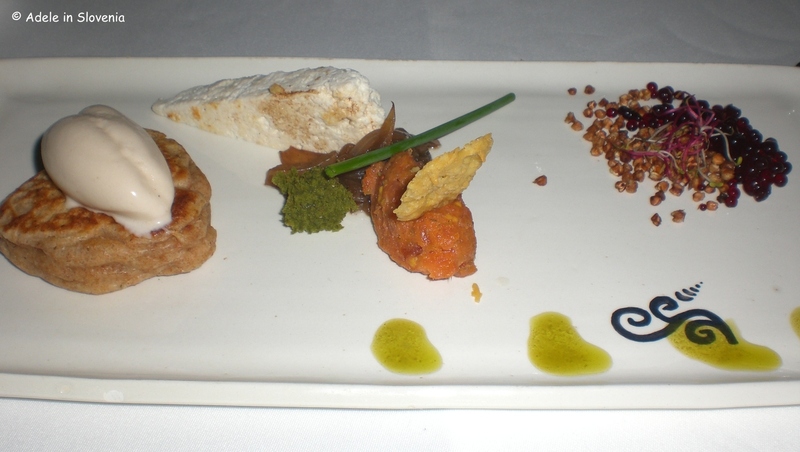 The main event then began – the opening Taste Radol’ca 2015 dinner – all 6 courses of it! The event was a complete sell-out, with all 90 places in the restaurant taken. The ethos of Taste Radol’ca is collaboration between restaurants and the use of local produced products. All the products used in the opening dinner, as well as those in the menus that are available at each participating restaurant for the entire month of November for a set price of just 15 euros for three courses, are local. 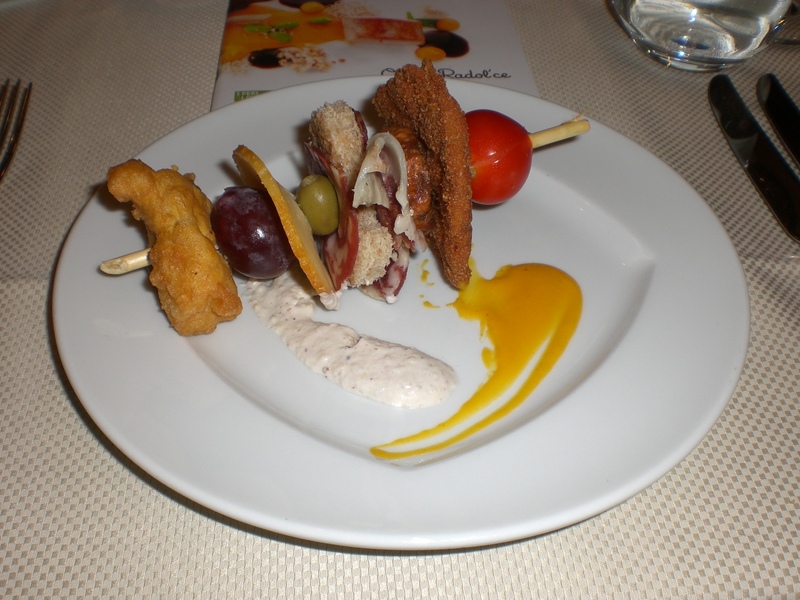 The starter was prepared by the Globočnik Excursion Farm from Globoko. 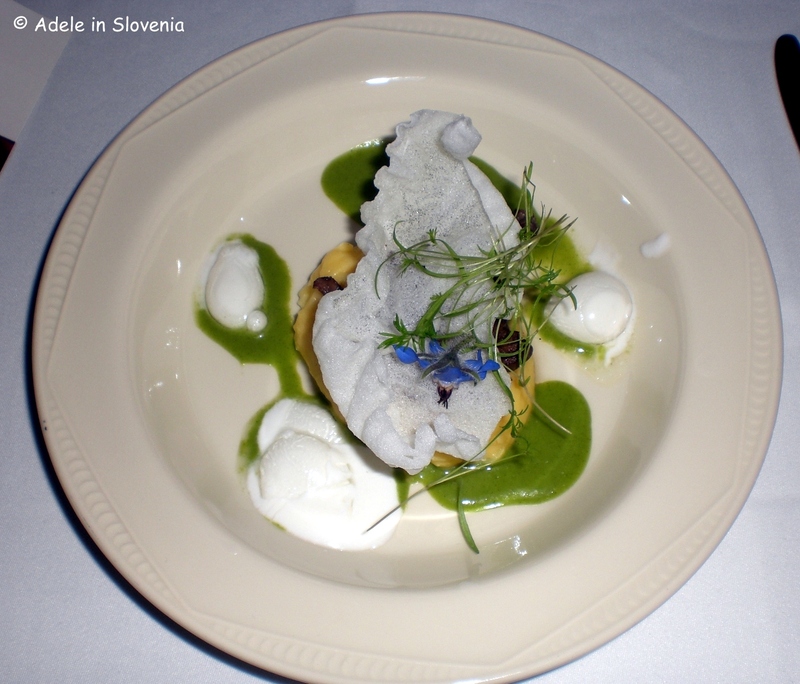 The next courses was a rainbow of trout with buckwheat hearts – prepared by Kunstelj Inn and Lectar Inn. Almost too pretty to eat! 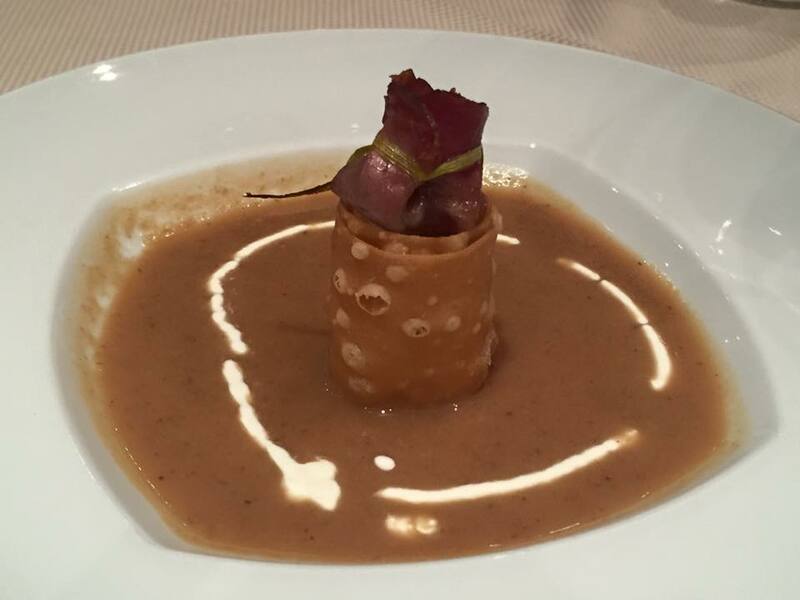 Next came the chestnut soup with mushrooms, just perfect for these autumn days, prepared by Tulipan Inn and Joštov hram. 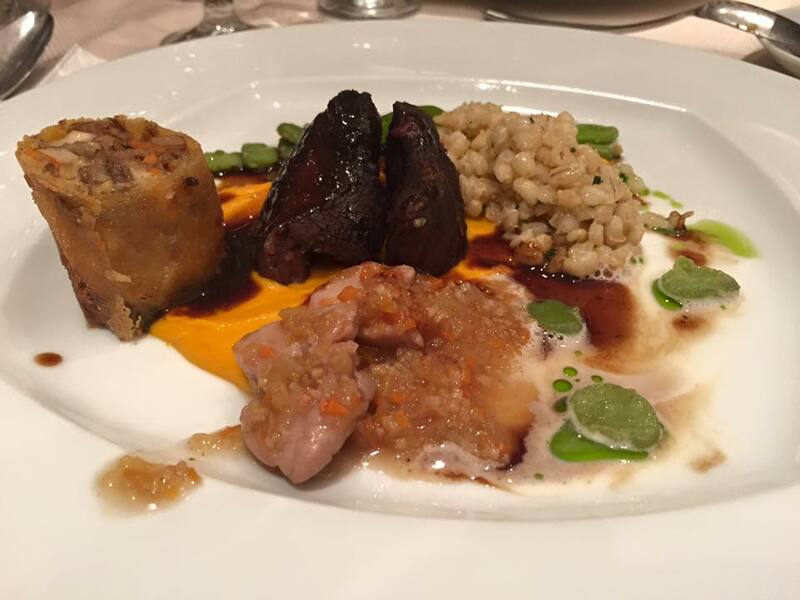 A farmer’s plate followed – prepared by Hotel Krek and Draga Inn. By now we were all beginning to burst at the seams but the delicious food kept coming! 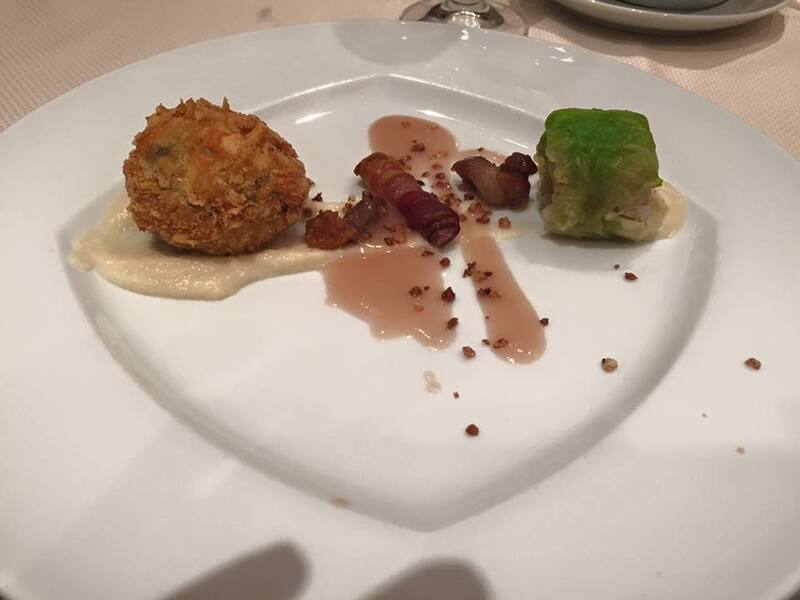 This dish comprised many elements including veal with mushrooms in cannelloni, cheek of calf, potato foam, barley and vegetables – courtesy of Lambergh Chateau & Hotel and Vila Podvin. And finally the dessert. 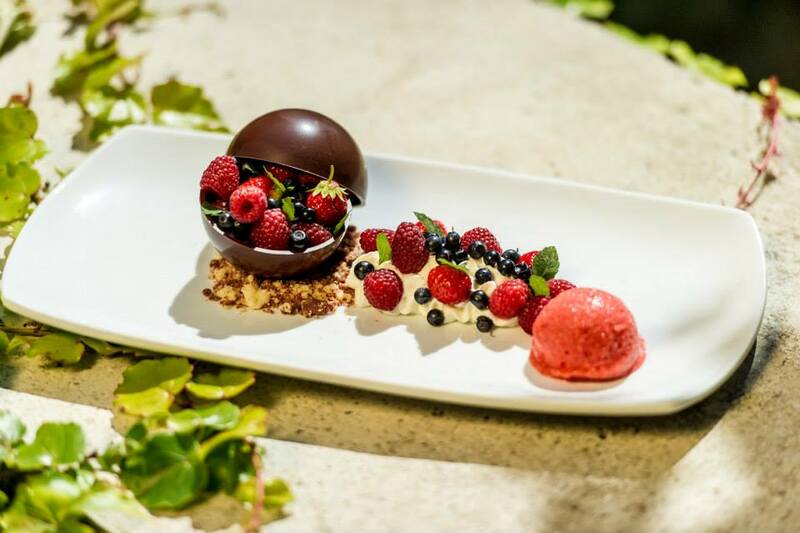 It’s funny how however stuffed one is, we somehow always manage to find room for dessert, don’t we! 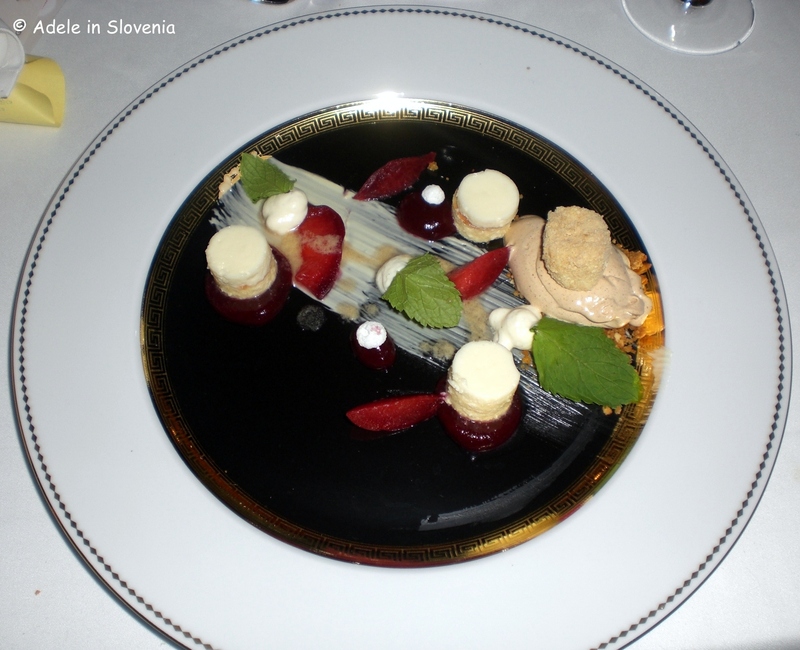 Dessert was prepared by Grajska gostilnica, from right here in Radovljica, and the restaurant ‘Pri Jožovcu’ – home of Avsenik in Begunje na Gorenjskem. Suffice to say a great night was had by all and that was just the start. Now we have the whole month of November to try out the Taste Radol’ca menus at all the 11 participating restaurants and, if you manage to eat at 7 during the month, you can earn yourself automatic entry to the Taste Radol’ca Closing Party on 4th December at Joštov hram. So get eating and tasting the local culinary delight of Radol’ca! For more information and to see the menus click below and I wish you bon appetit!